The Motobecane Boris X7: Shiny Turd or Deal of the Century? Shortly after I brought home the Farley I went for a ride with my wife and son. My wife took it out for a quick spin. She returned with that ever so familiar grin everyone seems to have after their first fat bike experience and announced that this was the bike she wanted to ride from now on. 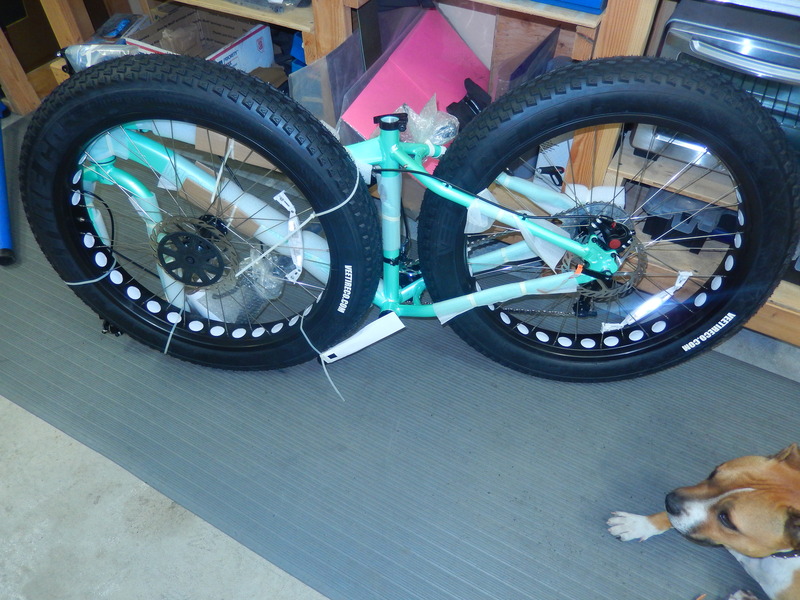 She was just starting to get back into mountain biking and really liked the stability she felt from the larger tires. So from then on when she rode with me I was back on my custom built skinny tire ride and she was on the fatty. It was worth the sacrifice to rekindle her love for riding. As the months rolled by she was riding more often and I found myself missing my time on the Farley more and more. When I realized she would pass on rides just so I could ride my fat bike I decided to take action. I first looked at building her one from the ground up. Then I looked at picking up a demo in order to try and save a few bucks. I knew she wouldn’t go for dropping a couple thousand on yet another bike even if it was for her (in the last couple years we’ve brought home 10 new bikes!). It was about this time that she announced that she needed a new kitchen. Okay the budget just got a lot tighter. I had heard of bikesdirect.com before and had perused their site a time or two. The prices looked pretty amazing for what they were offering. I zeroed in on the Boris line of Motobecan fat bikes. They seemed to offer the most for your money in a good looking package. The Boris X7 was what we ultimately settled on, color options had a lot to do with this. She liked the sea foam green so that’s what she got. I’ll be completely upfront with you here. I did not have high expectations for this bike. The Boris X7 was $699.95 shipped to my door and they compared it to bikes costing $1600. What a bargain right? I’ve learned that if something looks too good to be true it usually is. I took a good look at the specs before ordering. It was pretty apparent that they were cutting costs on several of the components like the wheels and hubs, cranks, bars and so on. After evaluating all this I figured for the type of riding she would be doing, (she is not an aggressive rider but loves to get out and enjoy the trails with the rest of us), that the Boris X7 would probably do the job we needed it to and the price fit our budget. Communication from Bikes Direct after placing the order was excellent. I got an email confirming my order and a day later another came letting me know our bike had arrived in their warehouse and it was shipping out the next day. It arrive 9 days after placing the order. Not a bad turn around time. 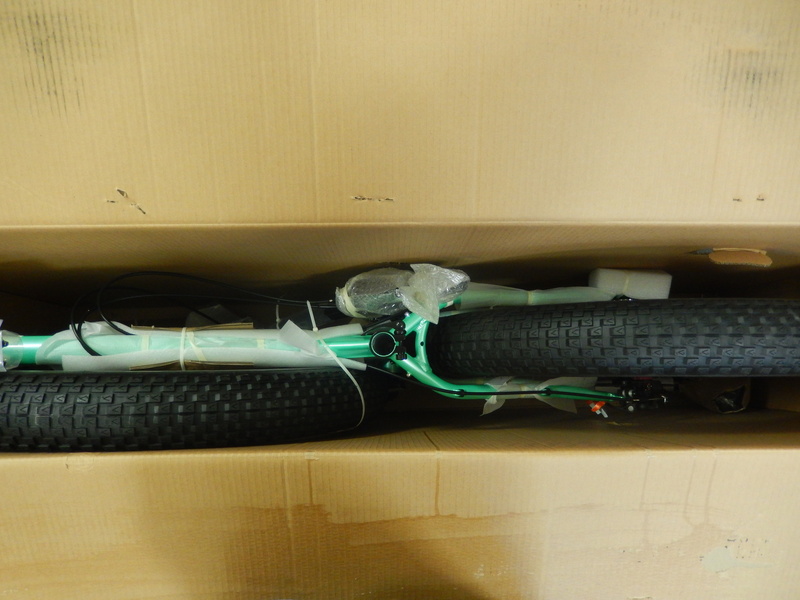 The box was in good shape and the bike arrived in good order with all the parts it should have. 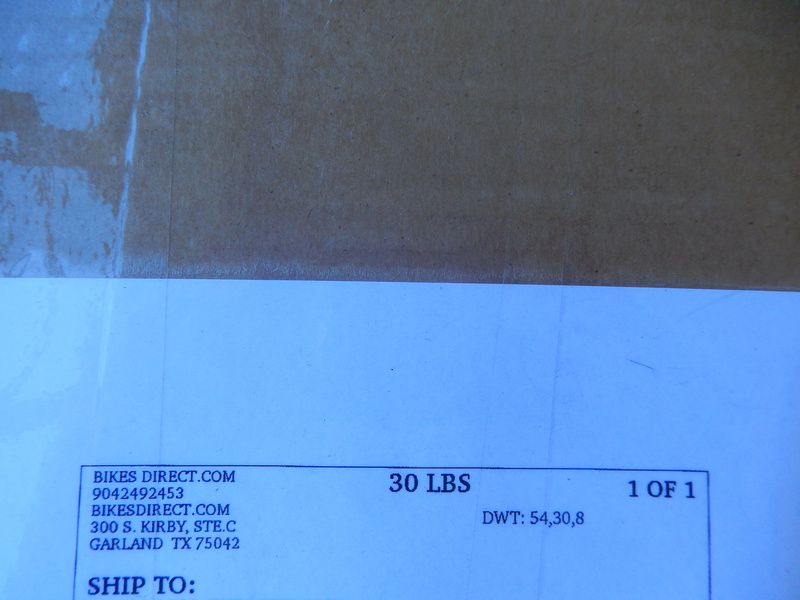 The UPS label had a ship weight of 30 pounds listed on it! I found this hard to believe, especially after lifting the box, so I put it on a scale and got a weight just under 48 pounds. That was closer to what it felt like. I’m not sure how they came up with that shipping weight, maybe they have a different method I’m not familiar with, but it could be a bit deceiving. The next concern I had was how the color was going to match up to the online color samples. I popped the top so my wife could have a look and give her approval. To my surprise the color was spot on with what they showed on the website. Colors are often slightly off from how they appear on a computer screen. So with my wife trying to restrain her enthusiasm over her new bike, I packed it off to the shop for assembly. As I mentioned earlier, I did not have great expectations and expected to find some issues during the assembly process. 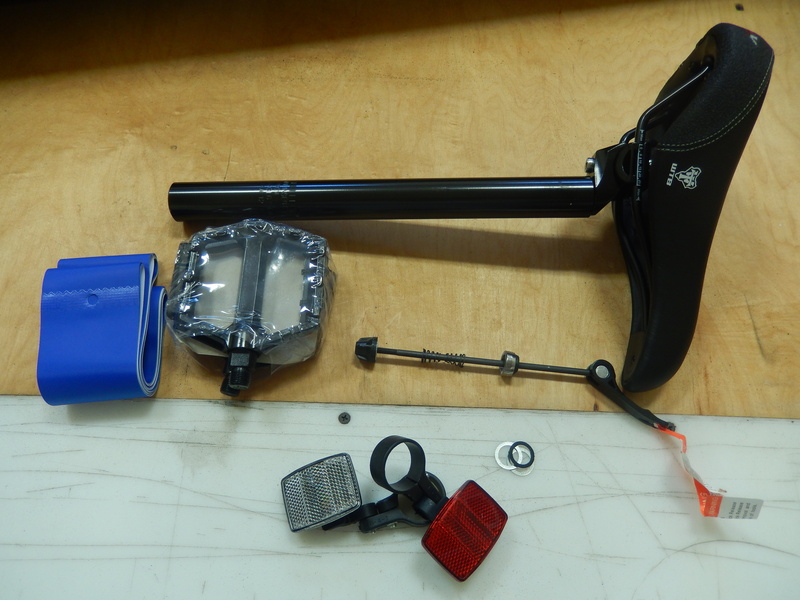 I was pleasantly surprised to find everything in good order with all the parts needed to complete a rideable bike including a set of metal platform pedals. I wasn’t sure it would come with pedals and figured they would be cheesy plastic ones if it did so that was a nice surprise. I had purchased an inexpensive set of Welgo platform pedals with removable studs for $21.99 so we wouldn’t be stuck with a bike we couldn’t ride right away. Set up was very straight forward. I did have to reroute the front derailleur as it was set up on the wrong side. This seems to be a fairly common issue from other Motobecane bike reviews I looked at after the fact. Not a big deal to change and I had no other issues during set up. 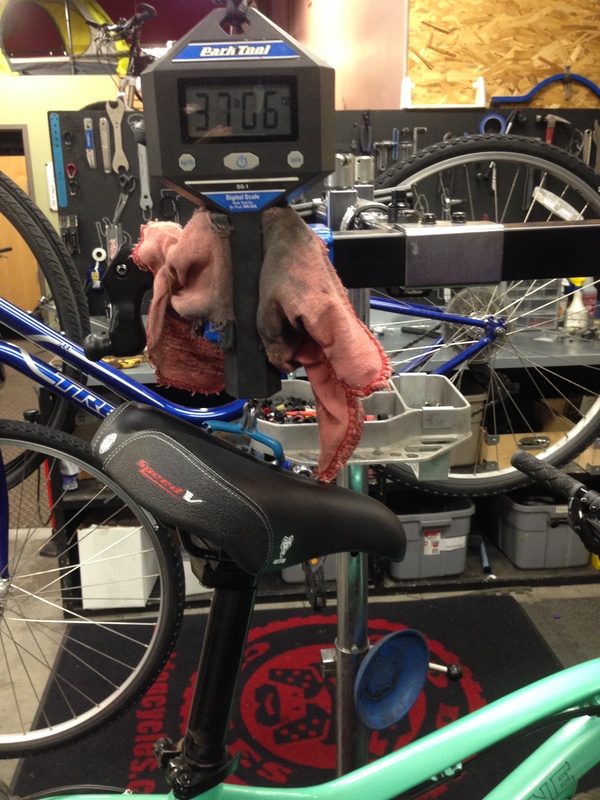 Aligning the brake calipers and a little tweaking on the derailleurs and the Boris was ready to ride. The first test rides proved that the Boris X7 is a very capable fat bike. The ride is comfortable and handling on the dry summer trails we rode was good. The 26×4, 72 TPI Vee 8 tires from Vee Tire Co. seem to be an excellent trail tire. They roll smooth and traction was excellent in nearly every situation we encountered. I found that they did start to break loose a little on some climbs that were a bit gravely but nothing I would consider detrimental. We did not encounter any muddy conditions so I can’t comment on how they may perform there. I will go out on a limb a bit here and say I think they will be pretty useless as a snow tire but then again it was not designed or meant for the snow. I only mention that because many people looking at these bikes plan to use them exclusively for snow riding and they might want to know they will be buying a new set of tires right off the bat. 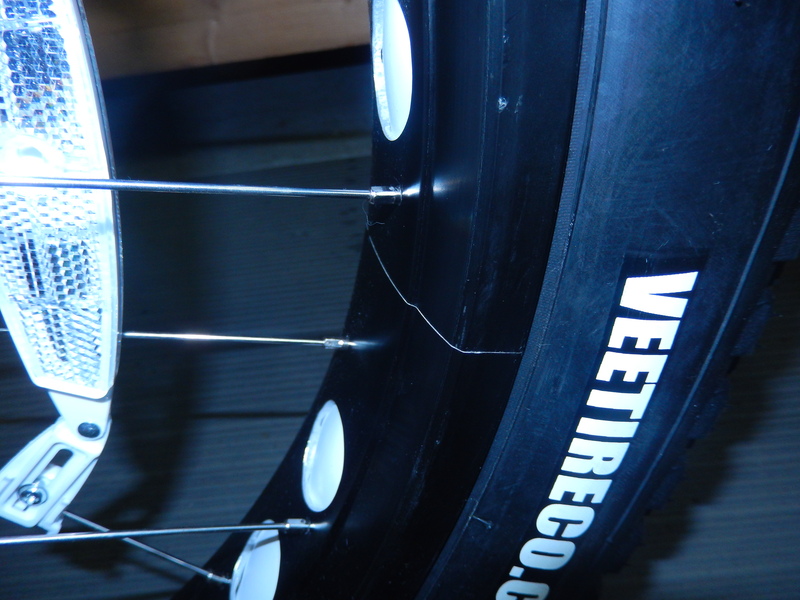 The Vee 8’s are marked “tubeless ready” though I haven’t taken the time to set them up yet. Speaking of going tubeless, I do have some concerns with the rims and the tubeless setup. The wheels are probably the area Motobecane saved the most money on the X7. At a glance the wheels look decent enough but closer examination reveals some concerns. Neither the rims or the hubs have any branding or manufacturing marks of any kind that I can see. You have to wonder about any manufacturer that isn’t proud enough to even put their name on the products they make. The wheels are pretty heavy. The rims have a pretty pronounced seam that has me concerned about durability as well as their ability to seal well for tubeless tires. 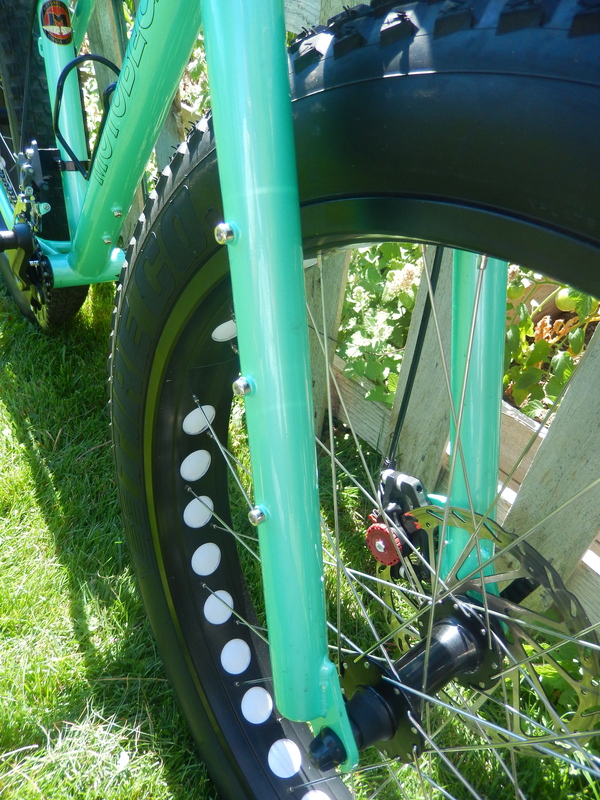 I think most of us on fat bikes are used to the quality we see on Surley rims with their beautifully welded seams, lightweight, and durability. These wheels fall very short of that standard. Other areas Motobecane saved money, and added weight, on the Boris X7 is the seat and seat post, handlebars and stem, brake levers, and cranks. 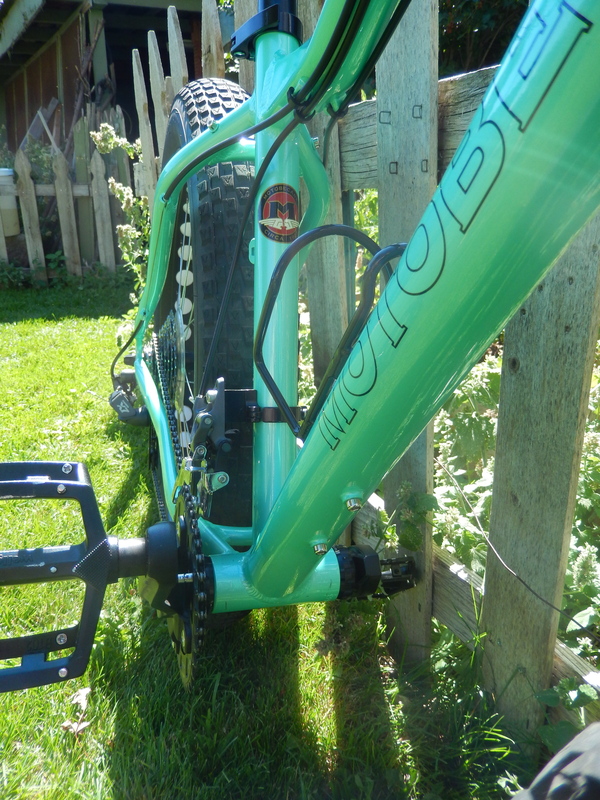 The steel front fork helps bring their cost down as well as adding a bit of weight over an aluminum one but this will also dampen some of the front end shock a bit so this may or may not be a downgrade depending on what you are looking for in a fat bike. I do like that the Boris X7 has an aluminum frame. This shaves a good bit of weight over a steel frame and gives it a more responsive feel to it. I also appreciate the three braze on mounts on either side of the fork for mounting racks like the Salsa Anything Cage and the mounts for a rear rack. Fat bikes are ideal for backcountry touring and these features don’t detract from the aesthetics or add a significant amount of weight. They’ve also added a second set of water bottle mounts on the bottom of the down tube. I used to think this was a terrible place to carry a water bottle because it catches all the dirt and mud that comes off your front tire. Upon further consideration, it happens to be an excellent place to carry an extra bottle when your standard cage mount in the middle of your frame is covered by a frame pack while bikepacking. All these features open the Boris up to bikepacking and touring options which makes it much more versatile than other fat bike options out there. So lets get down to answering the question we started out with. Is the Motobecane Boris X7 just a shiny turd to be avoided or has Bikes Direct found some secret for building super awesome bikes for half of what everyone else can? I think the answer lies somewhere in between. I think that for $699.95 we got our money’s worth with the Boris X7. Bikes Direct likes to compare this bike to others priced at $1,600 or at the very least want us to think that this bike would normally retail for that but they have a super sweet sale going on. I think this is very misleading at best. The Boris X7 does not compare to a Salsa or Surley with similar derailleurs that sell for $1,600. 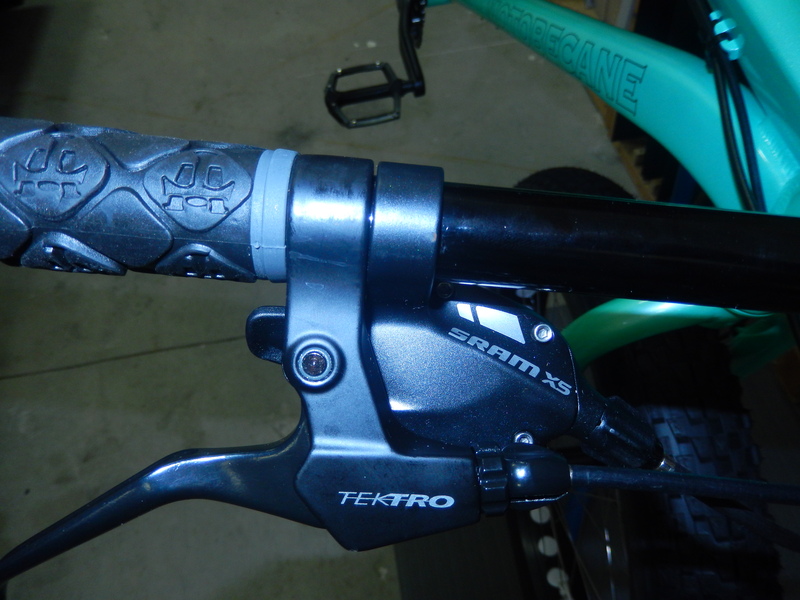 What they have done here is put higher end derailleurs on a lower end bike because they know that is typically what people look at to determine the quality and performance level of a bike. Keeping that in mind, I don’t think you are getting ripped off. At this point in time I feel like we got what we paid for and that the Boris X7 will serve my wife very well for years to come. 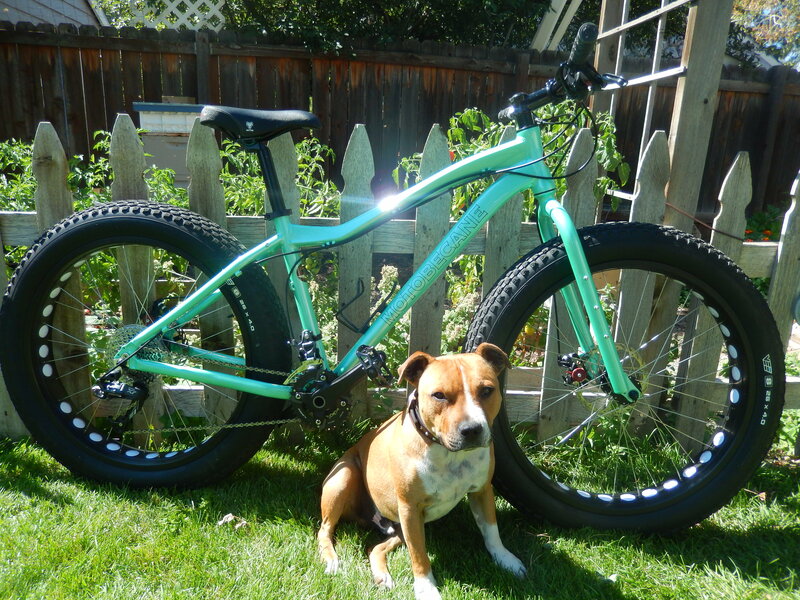 As I mentioned earlier, she is not a hard rider but enjoys the comfort and confidence a fat bike gives her on the trails for her riding style. 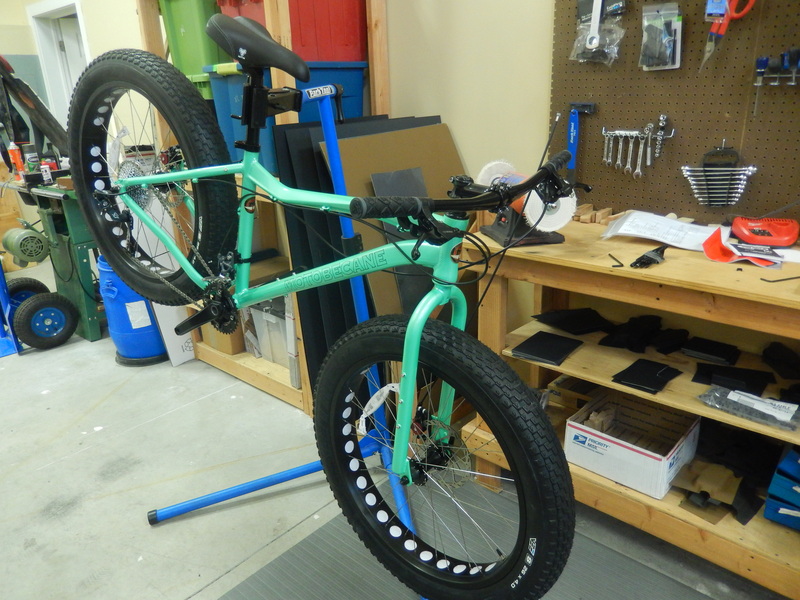 If you are a serious rider hitting a few, or many, races during the summer season and want a fat bike so you can stay in shape through the winter, I think you will probably be disappointed with what you get here. I am not a gentle rider and I’m not sure the Boris X7 would hold up to my satisfaction. Keep in mind that this is just a preliminary review. The real test will come over the next few months. If bearings and wheels are having issues by Spring or next Summer I will not feel so good about my purchase. There are more and more fat bike options out there every day and there is a bike for every taste and ride style. Prices across the board seem to be dipping now with so many manufacturers jumping into the fat bike arena. I believe what Motobecane and Bikes Direct are offering have there place. Just be aware of what you are getting and understand that more times than not you really do get what you pay for. Here is a video review with some footage of the Boris X7 in action. great review, thanks for taking the time to write it up. Hey Bullet, I really enjoy your reviews. I was thinking about getting a fat bike. I live in NC, so I don’t get much snow, so I’ll be using it as a fun change up. Now that you’ve had a little more time with the Boris, do you feel it offers pretty good bang for the buck or is it worth the extra grand for the Farley 6? I have a really good relationship with my local Trek shop here in NC. But of course the wife doesn’t understand why I’d want more than 1 bike! So this writeup is over 7 months old…. any updates?